Recently, several investigations have been carried out on the in situ bacteria flooding, but the ex situ biosurfactant production and addition to the sand pack as agents for microbial enhanced oil recovery (MEOR) has little been studied. In order to develop suitable technology for ex situ MEOR processes, it is essential to carry out tests about it. Therefore, this work tries to fill the gap. The intention of this study was to investigate whether the rhamnolipid mix could be produced in high enough quantities for enhanced oil recovery in the laboratory scale and prove its potential use as an effective material for field application. In this work, the ability of Pseudomonas aeruginosa MM1011 to grow and produce rhamnolipid on sunflower as sole carbon source under nitrogen limitation was shown. The production of Rha-C10-C10 and Rha2-C10-C10 was confirmed by thin-layer chromatography and high-performance liquid chromatography analysis. The rhamnolipid mixture obtained was able to reduce the surface and interfacial tension of water to 26 and 2 mN/m, respectively. The critical micelle concentration was 120 mg/L. Maximum rhamnolipid production reached to about 0.7 g/L in a shake flask. The yield of rhamnolipid per biomass (Y RL/x ), rhamnolipid per sunflower oil (Y RL/s ), and the biomass per sunflower oil (Y x/s ) for shake flask were obtained about 0.01, 0.0035, and 0.035 g g−1, respectively. The stability of the rhamnolipid at different salinities, pH and temperature, and also, its emulsifying activity has been investigated. It is an effective surfactant at very low concentrations over a wide range of temperatures, pHs, and salt concentrations, and it also has the ability to emulsify oil, which is essential for enhanced oil recovery. With 120 mg/L rhamnolipid, 27 % of original oil in place was recovered after water flooding from a sand pack. 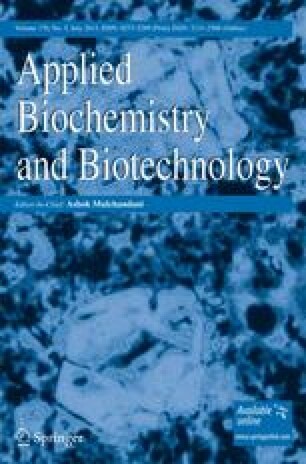 This result not only suggests rhamnolipids as appropriate model biosurfactants for MEOR, but it even shows the potential as a biosurfactant of choice for actual MEOR applications. We thank Sandra Baumann, Barbara Hörmann, Michaela Kugel, Markus Andre, and Mareike Perzborn for their experimental help.